The state of emergency has been used on and off since 1971 against Tamil rebels. The current government first invoked in 2005. 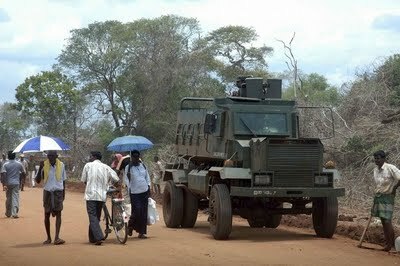 Doubts remain however over how civilian rule can be implemented in Tamil areas currently under military control. Residents now fear that more restrictive laws will be put into place. Colombo (AsiaNews) – President Mahinda Rajapaksa said he would lift the state of emergency enforced since 2005 to fight the Tamil Tigers (LTTE). The law “will not be extended further,” he said in a statement to parliament. Doubts remain however about how civilian authority will actually replace the current military administration, especially in areas once held by the LTTE. For Marimutto Sathivel, a Tamil Anglican priest in Colombo, the president’s announcement is good news. However, people will wait to see how it will be implemented on the ground. Lifting the state of emergency will be complete only when families still held in refugee camps will be allowed to go home and that all regions under military control will return to civilian rule. In fact, many people do not trust the president. “The state of emergency could be implemented under new laws,” said Jude, a Catholic social activist. In power since 2005, Rajapaksa has made similar declarations, only to bypass the law by means of presidential decrees or anti-constitutional rules. For example, in 2010 he won re-election after he had his main rival, Sarath Fonseka, arrested on charges of attempting a coup. In the following months, he tried unsuccessfully to increase the powers of the presidency and extend his mandate. In recent years, the United Nations has criticised Sri Lanka for the state of refugee camps in the northern part of the country, and for human rights violations. Mr Rajapaksa and his government have always rejected such criticism, and limited access by activists and foreign officials and journalists to the northern regions under military control. Except for brief periods, Sri Lanka has been under emergency rule since 1971, Perera said. Sri Lankans have become accustomed to life with restrictions and do not know how people live in a free society. This is especially true for the police, whose members have been recruited under Rajapaksa’s tougher emergency laws. Freedom of movement for Tamil refugees, real or election promise?